Revenues are projected at 706bn hryvnyas, spendings at 775bn hryvnyas. 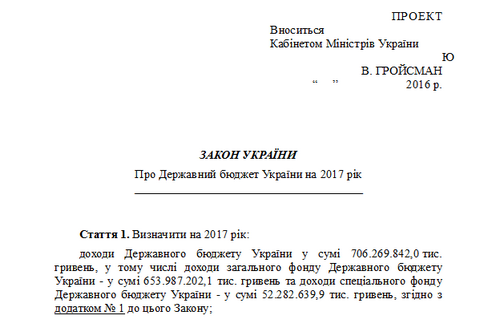 The text of the draft national budget for the next year has been published on the website of the Ukrainian parliament. Corresponding bill No 5000 was registered with parliament on 15 September, but its text was not available until Monday, 19 September. The budget revenues in 2017 are planned at 706.3 bn hryvnyas (including the general fund revenues of 654.0bn hryvnyas and revenues of the special fund of 52.3bn hryvnya). The budget expenditures should amount to 775.3bn hryvnyas (including those of the general fund, 720.0bn hryvnyas, and those of the special fund, 55.3bn hryvnyas). The maximum amount of the budget deficit is set at 77.5bn hryvnyas (including the maximum size of the general fund deficit, 62.3bn hryvnyas, and the maximum size of the special fund deficit, 15.2bn hryvnyas). The maximum amount of public debt by 31 December 2017 is set at 1,720bn hryvnyas. The subsistence minimum for able-bodied persons in 2017 will increase as of 1 May to 1,684 hryvnyas and as of 1 December, to 1,762 hryvnyas. The minimum wage will equal the subsistence minimum. The budget revenues for 2016 were set at the level of 601.9bn hryvnyas and expenditures at 674.5bn hryvnyas.